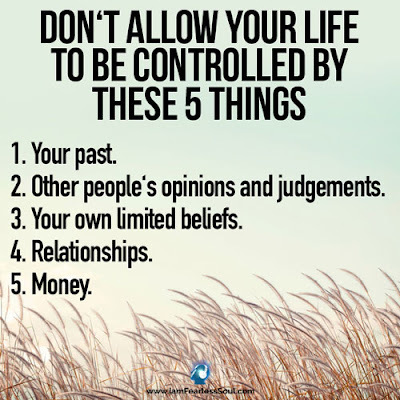 Don’t allow yourself to be controlled by these 5 things. Many people spend their life, at the mercy of circumstances. Living at the mercy of what happens to them. Living at the mercy of other people. NOT living in the present, because they are stuck in the prison of their past. NUMBER 1 – Your PAST. NUMBER 3 – LIMITED BELIEFS you project on yourself. Do not allow your past to control your PRESENT or your FUTURE. Whatever happened, you must let it go. Leave the pain of your past behind… so it can not ruin your future. Leave the darkness of your past behind so it can not block the light of your bright future. Your past is gone. Whatever happened, whether unjust, cruel, harsh, whatever the case, reliving the events will never do you any good. If someone did you wrong, the ONLY WAY you can win, is if you let go and move on. If you live in hate, they win. If you live in the victim story, they win. If YOU want to win, you must focus on building your future, and start right now. Release that weight from your back so you can be free. Don’t allow events of the past, which are now gone, to ruin this moment, which is perfect – this moment which is now to enjoy, which is ready for you to LIVE FULLY. Do not allow other people’s opinions and judgements to control the direction of your life. The need to fit in and feel wanted can cause you to travel down paths you don’t want to travel. People pleasing is a curse that should be avoided at all costs. Am I doing this because I want to do it?… or because of my fear of judgement from others if I don’t do it. You were born unique for a reason, you were born to stand out, to be appreciated and loved for WHO YOU ARE. Don’t dim your light so you fit into the dull background of other people’s life. Shine bright AS YOU ARE, those who really care for you will see that light and shine with you. Do not allow your life to be controlled by your own limited beliefs. NOW, a warning with this one. These beliefs may be conscious, but more than likely they will be unconscious. They may be unconscious limitations that have been conditioned from a young age and throughout your entire life, by listening to those around you who never reached for their own dream. Notice your limited beliefs and tell them to shut up. There is NOTHING you can not do, NOTHING you can not have, and as this UNIVERSE is my witness there is NO ONE you can not become if you believe in yourself! If you believe anything is possible, guess what, anything IS POSSIBLE! When you change your belief from limited to unlimited…. Imagine what you could achieve if you lived your life as though ANYTHING is possible. As though MIRACLES are a standard requirement of every day. When you have nothing inside holding you back, there is nothing outside that can hold you back either. Your entire life will change the very instant you decide to change your mindset. The instant you decide to see everything as a gift. When you DECIDE to see every circumstance and challenge as a blessing rather than a curse. When you become conscious to the fact that everything is as it should be, and fighting WHAT IS, is insane. Relationships. A touchy subject. But, if you are always needing another to be happy, to feel complete, then you are always one moment away from a breakdown if that person leaves, or unhappiness if the relationship is not going well. I am not suggesting to avoid relationships. There is no force on this earth greater than LOVE and connection. am talking about those who can’t LIVE if they aren’t in a relationship. Those who will be with just about anyone, including all the wrong ones, just to avoid spending a moment being single. What I AM saying, is to develop enough mental strength that you get to a point where you don’t need others to make you happy. You are just as happy being alone, as you are in a relationship. This is what controls the majority of humans on the planet. Can you guess what it is? This does not mean you shouldn’t want abundance. It doesn’t mean money is evil. You know as well as I do what great things you can do, and people you can help with money. What this means is, do not allow your decisions to be controlled by money. If you are choosing something ONLY on the factor of how much money is involved, you’ve just made the wrong decision. What you will find, is that when you follow your heart, and you lead with your intention to SERVE others, to give your best to others – EVERY SINGLE TIME, when you follow your intuition and truly GIVE from your soul – then, the money will come, and it will come in far greater amounts than if you simply chase money for the sake of chasing money. So, challenge yourself to live the life you want to live. Free from being controlled by ANYTHING.